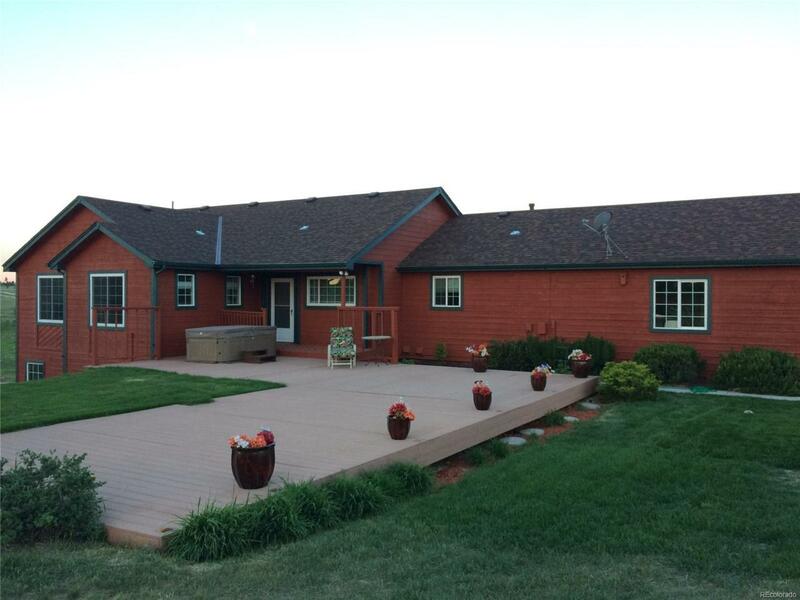 Beautiful raised ranch with stunning views of the entire Front Range. Located on over 6 acres of private land. Welcoming front porch and deck area with a hot tub, perfect for entertaining. Sprawling open concept layout with vaulted ceilings and brilliant natural light. Lovely laminate flooring throughout. The great room has a gas fireplace and opens to a large deck for enjoying the Colorado sunsets. Updated kitchen features granite slab counter tops, new black stainless steel refrigerator, under-mount sink and breakfast bar. Off of the main living area is a bedroom with French doors that could serve as an office or playroom. The master retreat has vaulted ceilings and opens to the back deck with gorgeous mountain views. It boasts a 5 piece en suite bathroom with jetted tub and a walk-in closet. The walk-out garden level is a full footprint of the home offering great additional space. Freshly sealed driveway leads to the 3 car garage. Hobby farm available Approved for animals.